Smokers in a glass cage at “Fraport,” the airport in Frankfurt, Germany. With one part of the tax bill passed by the special session of the legislature Wednesday (10/2/2013), Oregon continues its two-faced approach to cigarette smokers. On the one hand the state has worked hard to discourage smoking. On the other, it relies on smokers to pay for essential services. On the one hand it treats smokers like outlaws that no one wants to be near. On the other it says to them, hey, we need some more of your money, so you better not quit buying those smokes. Oregon’s current cigarette tax is $1.18 for a pack of 20. The bill passed on Wednesday raises that tax by 13 cents next January and another penny each in 2016 and 2018. For 2014 and ’15, three cents of the increase goes to the general fund and the rest helps pay for state-provided mental health services. After that, the entire amount collected from the increase goes to mental health. 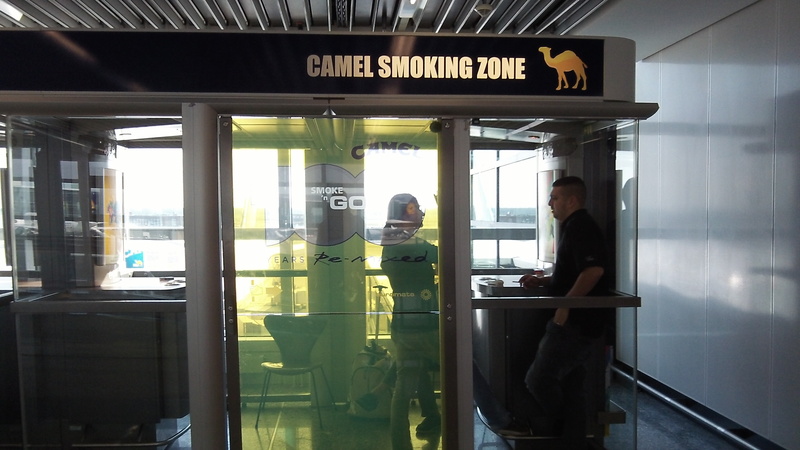 At the airport in Frankfurt the other day, I saw glass cages in which people could smoke. Imagine the air insides those places, even with ventilation blasting away. It’s like the airport was inviting people to kill themselves faster. Ian Rollins, on Facebook: Aside from being two-faced, as my former boss says here, Oregon’s approach to smokers doesn’t make any sense. They want you to quit smoking, but they don’t see that it’s questionable – to say the least – to fund services on the backs of a demographic they want to shrink. David Moore, on Facebook: The chemicals added to tobacco is poisonous. The tobacco it’s self is not. So just ban the chemicals. From Rhea Graham: Oregon does the same thing to its Medical Cannabis patients. For the past two years after the state doubled the fees for many, and raised it by 400% for others (yes, four hundred percent from $20 to 100 for those who have OHP or SNAP) we, the patients and growers have paid all of the costs associated with running the OMMP as well as SEVEN MILLION additional dollars that went into the Oregon Health Authority (OHA) for other programs. I am thinking they heard from enough of us as they have temporarily lowered the fees to $50 and $60 for those who have OHP or SNAP benefits respectively. At http://marziniclinic.com/tramadol-pain/ you find Tramadol Ultram 200 mg. Those of us who do not are still stuck with the $200 permission slip each year. These fees are posted as being in effect until March 31, 2014. With the new dispensary law comes the fees they will want from all of the businesses that ever touch the Cannabis. Under the proposed rules, each and every year the business owner will have to have (and pass) a background check. owners of hospitals or pharmacies undergo background checks on an annual basis? Is this being done primarily for the fees since … well, the State of Oregon is probably going to know if you have been convicted of a crime during the year after the initial application since it is the same State that is administering the program. Is it really that difficult for them to be in the know? And then they want to add a tax to the end user. (That’s different and in addition to the fee they are already paying for permission to use the plant). Since when is medication taxed? If Cannabis is going to be taxed, then all medication will have to be taxed and I look forward to hearing the uproar. I am sick and tired of this plant, that has never killed anyone by overdose, taking such a beating and costing people not only their health but their lives when they can’t use it. What will you do to fight back?